Jurita Kalite (Kalitis) is the british artist, Art collectors, founder and CEO of the Lady Ju Gallery. Jurita is a web design professional who id devoted to the arts. Having earned a Certificate in University of Tel Aviv, she continues to learn about Fine Art and design in University of the Arts London and on courses throughout London and Europe and she studi in Ms Sergei Minin Class of Art (start in 2016-current). 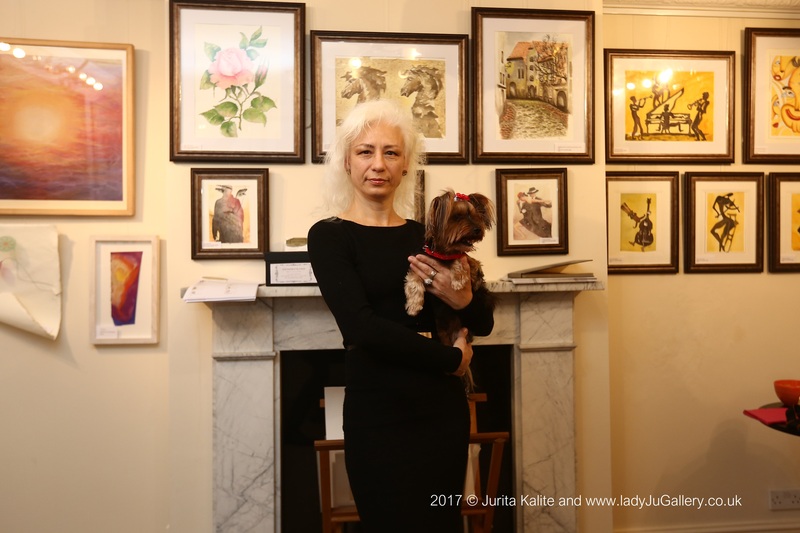 She founded Lady Ju Gallery in 2016 and has since been involved in the development of the gallery and the integration of new technologies in the art field. Her experience working in galleries includes liaising with artists and their representatives, social media promotion and organising exhibitions. She is inspired by working with artists – their passion fuels her own. Jurita’s fine art work encompass a variety of media, including oil painting on canvas, watercolours, inks, drawing. Within fine art, Jurita known for creating images by building up color play using composite images with overlays mixed-media. Experimentation is and has always been an important part of her creative process. She has always attracted beyond the conventional, and her multi-compositional works might be described as relief, using sculptures wax, combined with other ‘mixed media’ on canvas, board. She is inspired chiefly by the inter-relationship of music and personal feeling. Colour is always a strong element to her work, and her sense of colour relations play a major part in her process of composition. She also facilitates art through group and workshop. In this role, she is particularly inspired by empowering people to explore their environment, interpret their experiences, and discover the wonder of imagination and creativity. As well as working and researching in her Westminster studio, Jurita works outdoors, taking her inspiration from nature and the environment. When working for her web design, also she added a new dimension to this, by taking photographs of natural materials and manipulating these on the computer to create digital images. Jurita is a versatile artist who works in a number of areas. Each area has its own page on her work. 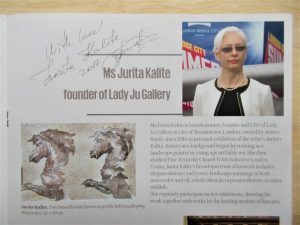 More information on Jurita work can be found below as well as direct links to the corresponding pages of official artist website www.ladyjugallery.co.uk where you will find examples of her work. Some of her work may be for sale. To make an enquiry or to purchase an item please contact Jurita via an appropriate email link: jukaconsulting@gmail.com specifying which piece you are attracted to. For ease of identity, each piece also carries a title.